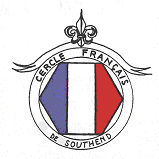 Welcome to the website of the Southend on Sea French Circle. We are a friendly group of French nationals and French speakers of all levels who meet regularly for lectures in French, small workshops, social occasions including film visits and musical evenings, conversation groups, dinners, a Bastille Day pétanque evening at a local pub and outings of interest. We are always pleased to welcome all those interested in the French language, including students. The lectures are very varied and include talks on wine, cuisine, places of interest, art, history, politics, literature, cinema and life in France in general. These evenings take place normally on the second Wednesday in the month currently at Leigh Community Centre in Leigh-on-Sea and at the end of the month (4th Wednesday) we usually have a conversation evening, again at Leigh Community Centre. We have an informal link with a small French town and look forward to building on this relationship. Please see our programme page for full details. ​There is now a "Southend French Circle" Group on Facebook. On the "Links" page of this website you can visit the Group by copying and pasting the link into your browser.